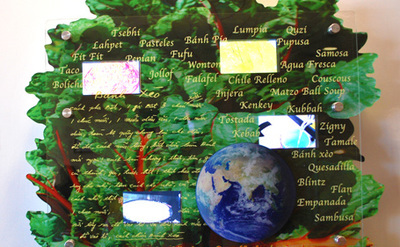 Grandmother’s Kitchen/Grandfather’s Garden is a stand-alone digital sculpture housed at the new La Maestra Community Clinic in City Heights. 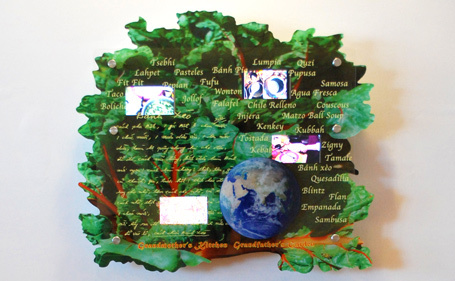 The installation is a 38” x 31”ft wall sculpture/digital display containing 2 layers of clear acrylic- printed with images, of recipes, plants, names of dishes and an image of the world. It houses 4 video monitors mounted behind the acrylic, embedded in the layers of images. Each monitor has a looping 10 - 15 minute video/slide show mix. Images include plants and food created by families in City Heights. Dishes include Bahn Xeo, Tamales, Enchiladas, Tostadas, Pupusas, Injera, Yogurt, Cous Cous, Pepian, Kenkey, Zigny, Agua Frescas, Matzo Ball Soup, Caldo de Pollo, Pasteles de Picado, Sambusas, Coffee, Black Eyed Peas, Chile Rellenos, Curries, and more. Community members are invited to contribute personal drawings, stories and recipes of their favorite meals in journals provided. La Maestra Community Health Center is an award winning LEED certified health clinic in the heart of the City Heights neighborhood. The mission and vision of La Maestra is to provide quality healthcare and support services to improve the overall well-being of the family, and to bring under-served, ethnically diverse communities into the mainstream of society in a caring and culturally competent manner that respects patients’ dignity. La Maestra Community Health Center serves 90,000 patients annually. 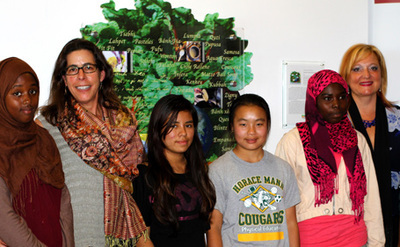 Press & Media: Read "New Susholtz public art dedicated" in the San Diego Union Tribune. Grandmother’s Kitchen/Grandfather’s Garden is a digital cookbook, a visual culinary history and a cultural archive of the City Heights neighborhood. This public art project presents the diverse history of the neighborhood through the shared experiences and culturally specific stories of food.Grandmother’s Kitchen/ Grandfather’s Garden is envisioned as a digital visual poem that traces the rich history of immigration to this community. It was commissioned by the City of San Diego with funding from the Niki de Saint Phalle Foundation and installed at La Maestra Community Health Center4060 Fairmount Ave. San Diego, CA 92105.